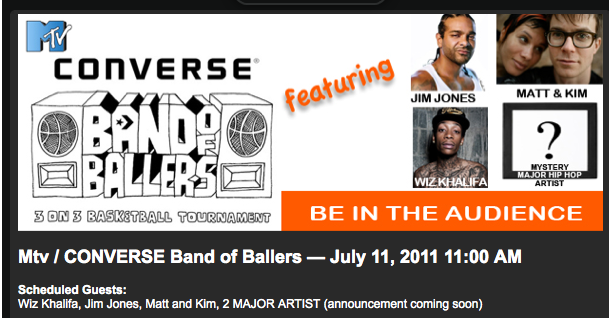 The Converse Blog: Converse Band of Ballers 2011 is happening!!!! So color me surprised by this news, the Converse Band of Ballers tournament lives on. Last year the tournament was in May and when May and June came and went with no tournament I thought it had been canceled. Turns out that they just moved it to July. Now catch this, MTV2 will be filming the tournament. Not sure if it will be broadcast as a special event or just mixed in here there with other programing. I'll try to find out that for you all. So whose playing this year, well Jim Jones will be back to defend his Championship. Matt and Kim will be back this year too. Making his debut will be Wiz Khalifa will be bringing a team to compete as well. Also they are teasing 1 or 2 Big time Hip Hop artist as soon as I figure out who it is I will let you know. So when is this happening, well it's going down Monday July 11 in NYC. I am not 100% on where they're playing at so I'll try to get that to you also.